The SEAW/ATC-60 Commentary on Wind Code Provisions has been written for the benefit of designers, building code officials, instructors and anyone who designs and/or analyzes structures for wind provisions using the 2000 or 2003 editions of the International Building Code (IBC), or the 1998 or 2002 editions of ASCE Standard No.7, Minimum Design Loads for Buildings and Other Structures (ASCE 7-98 or ASCE 7-02, respectively). The Commentary is organized into two volumes. 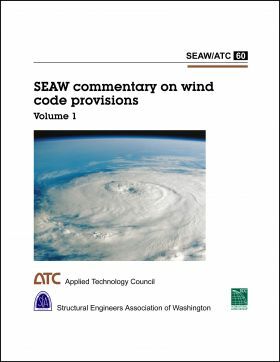 Volume 1 (238 pages) contains the main body of the commentary, which includes a technical and historic overview of wind codes and discussions on a broad range of topics: (1) basic wind speed; (2) importance factors; (3) exposure and topographic effects; (4) gust response; (5) design for wind pressures on main wind-force-resisting systems; (6) wind pressures on components and cladding of structures; (7) glass and glazing; (8) prescriptive provisions; (9) miscellaneous and non-building structures; (10) unusual wind loading configurations; (11) high winds, hurricanes, and tornadoes; (12) serviceability; (13) wind tunnel tests applied to design practice; and (14) wind design of equipment and non-building systems. Volume 2 (252 pages) consists of appendices containing 13 example problems with solutions.